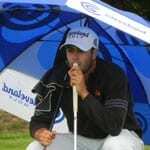 Twenty-two year old Professional Adam Hadwin capped off his 2010 tournament season in style, winning the CALLINAN MINES VANCOUVER OPEN with 54-hole score of -10 and a three shot victory over Californian Professional Isaac Weintraub. At the end of 9 holes on the final round it looked like the event was shaping up to be a two-man battle, as Hadwin took a one shot lead over the southpaw Weintraub into the back nine at -11. However, birdies on holes #11 and #14 by Nanaimo’s Darren Griff of the Canadian Tour took him to -8 and only 3 shots off the pace.